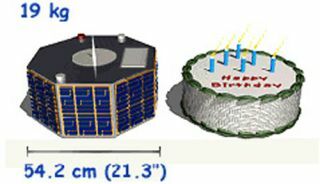 Comparison of a typical micro-spacecraft to the size of a birthday cake. Fleets of miniature spacecraft may now be closer to liftoff. To bring this sci-fi vision of 50-pound"micro-spacecraft" and 10-pound "nano-spacecraft" toreality, scientists have now invented a razor-thin skin that can protect craftagainst the extreme heat and intense cold found in outer space and withstandmicrometeoroids hurtling at thousands of miles per hour. Since launching just 1 pound of anything into orbit costs roughly$5,000, researchers are now developing miniaturelightweight spacecraft to send more probes and satellites up at lower cost.The U.S. militaryand NASAhave already sent a number of test micro-satellites into space. NASA aims toget the first communications micro-spacecraft prototypes operational by 2013. "You'dsee micro-spacecraft mainly in communications. Instead of companies sharing alarge satellite, you could have even small companies getting their ownmicro-spacecraft," said researcher PrasannaChandrasekhar, a polymer chemist and materials scientist at research anddevelopment company Ashwin-Ushas Corporation in Lakewood, N.J., which iscollaborating with NASA. "Forthe military, undetectability is also important, either for surveillanceapplications or when it comes to zapping other satellites," Chandrasekhar added. "And when it comes to aspacecraft less than 5 kilograms (10 pounds), you can't really detect it unlessit's within a quarter of a mile of you. Larger spacecraft can be detected fromfarther, and consequently blasted out of the sky." Developing new kinds of spacecraft is challenging. Outer space isan extraordinarily hazardous environment, and spacecraft can be frying in harshsunlight one moment and freezing in pitch black cold in another. "It may sound very trivial, but controlling the temperatureof a spacecraft is absolutely crucial. Currently, there is no way to do it forvery small spacecraft," Chandrasekhar said. In large spacecraft, loops of refrigeration pipes and whatChandrasekhar calls "glorified window blinds" help keep the machinescool. Besides their high weight and costs, such technologies are difficult orimpossible to shrink down for miniature spacecraft, he explained. Instead, the researchers developed an offshoot of a classifiedmilitary technology — a slender, lightweight film less than a half-millimeterthick that feels like flexible plastic and can alter its color when given anelectrical charge. This change of hue works not just in the visible spectrum,but in the infrared or heat range as well, meaning that it can go fromradiating heat in hot temperatures to absorbing heat in freezing temperatures. Thefilm was cycled repeatedly between minus 58 degrees F and 212 degrees F (minus 50degrees C and 100 degrees C) in a vacuum for three months to simulate theintense heat and cold of space that probes routinely experience. The film successfully endured such tests, and kept items itwas wrapped around at 122 degrees F to 176 degrees F (50 degrees C to 80degrees C), "which is just fine for spacecraft," Chandrasekhar said. Although thermal control technology makes up just one of manysystems onboard spacecraft, "thermal control was really the big barrier todeveloping miniature spacecraft," Chandrasekhartold SPACE.com. "This should allow much more rapiddevelopment of micro- and nano-spacecraft." Spacecraft also have to contend with micrometeoroids, bits ofspace debris traveling at more than 20,000 mph. "The test for micrometeoroids was very simple — we just fireda gun loaded with small particles and tiny, harpoon-like needles at it,"Chandrasekhar said. The film worked fine even after the mock micrometeoroidspunched holes into it. Spacecraft also have to contend with corrosive atomic oxygen, aserious problem for space stations and vital communications satellites, as wellas harmfulultraviolet rays and blasts of chargedparticles from the constant solar wind and recurring solar flares. The film has a protective layer to guard against suchatomic oxygen, and it also proved durable in tests with UV rays and chargedparticles. Chandrasekhar said his team is working to get their advanced skintested in space by the end of 2009. "A lot of spacecraft engineers have come to us saying, 'If wehad this technology, it would give us much greater design freedom for futuremicro-spacecraft,'" Chandrasekhar said. Earthbound uses also exist for this film, such as in countries withhot or cold climates, which could build homes with this film to better controltemperature cheaply. Chandrasekhar said they have already received overseasinquiries to make cinderblocks with this film. The scientists detailed their findings Aug. 19 at thenational meeting of the American Chemical Society in Philadelphia.